Christmas shopping has been the tipping point for me, in terms of our new debt-free journey. Here was a big red, green and glittered all over day that kept coming back, year after year and rearing its expensive head. It had gotten to the point where Christmas had become far more stressful than enjoyable and had completely eclipsed what we as a family value Christmas for - the birth of our Savior. How can you be focused on little baby Jesus, when all you're doing is scrambling to purchase for all the people and putting all the cost on credit cards? So last year was it for me. I couldn't stomach it anymore. And set out to do something differently. It has been the start of several more. But it was one step that got me going. Me alone at first...not the rest of my family. And not completely successfully - but we'll get to that part later. I wrote all of those above sentences separately to ensure you see them. In case you're in the same boat that we are in and are just starting this debt-free journey. In case you watch some of the budgeting channels on You Tube and think - that can never be me! Because it can - those people started in exactly the same spot. At some moment in their past they stopped their current spending habits, turned it around 180 degrees with a plan, and took the first step in the opposite direction. It's just that they are 3, 5, 7 years into it. And sharing all their tips because they are amazing. Thank you You Tubers! Christmas spending happened to be my spot. Maybe it's yours. If so, I want to share with you how we started our Christmas sinking fund. A sinking fund is a fancy phrase that simply means putting aside a small amount of cash for a certain amount of time. Here's how we set our up. Here's a smattering of our receipts from last year. It's a mix of cash spent and card charges. The large purchases? All on the card. My weekly planner and my Christmas cash envelope. A word about cash envelopes - if you are not familiar with Daisy Lane Design, full discloser - I sell cash envelope sets. That's how I make my contribution to my family. It's my job. The envelopes that I design and sew and sell I use for our family budget and cash spending. But they are not the only way to make this work and you do not need to use them on your debt-free journey, obviously. Find the method that works for you! These just happen to be mine, and I make them available for others. I use the planner to keep track of my weekly goals and whether I'm on track with my envelope. I use the envelope to stash my cash. 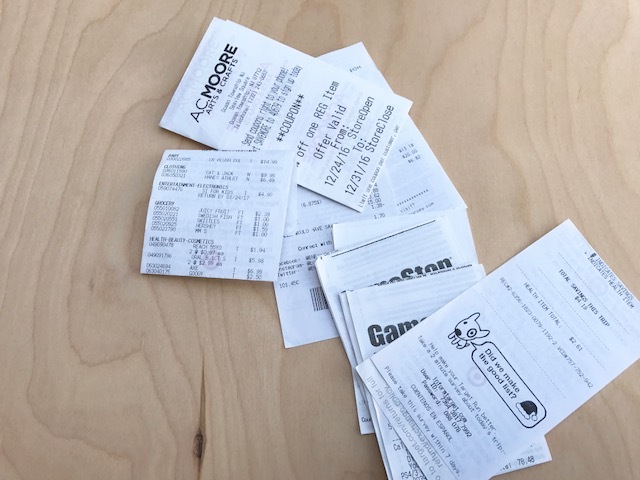 After adding up all of our receipts last year, I figured that a budget of $1000 would get us through the Christmas season without adding to our debt. This would cover all of our gift giving, including the kids, our families, teacher and bus driver gifts, food for gatherings, the tree and all the trimmings. I tacked on a few extra $100 to the actual sum for receipts I may have lost or forgotten, eating out while Christmas shopping, a last minute splurge. I really wanted to cover all the possibilities and come out winning. $1000 divided by 52 weeks is just under $20 a week. Boom. 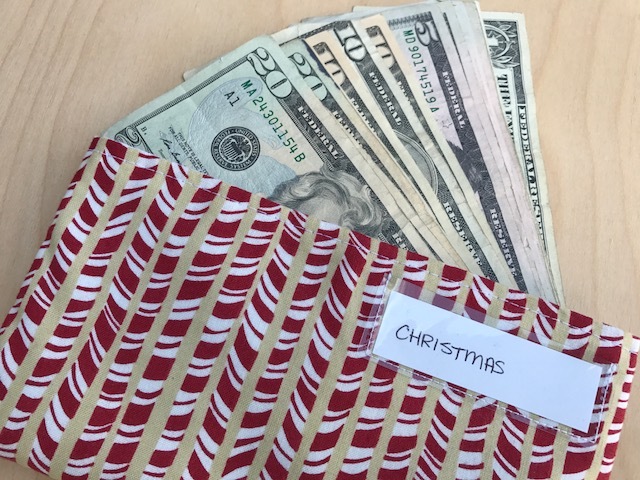 Every week I needed to put a $20 in the Christmas envelope and then not touch it. I went to the planner and wrote down that amount on every Monday. 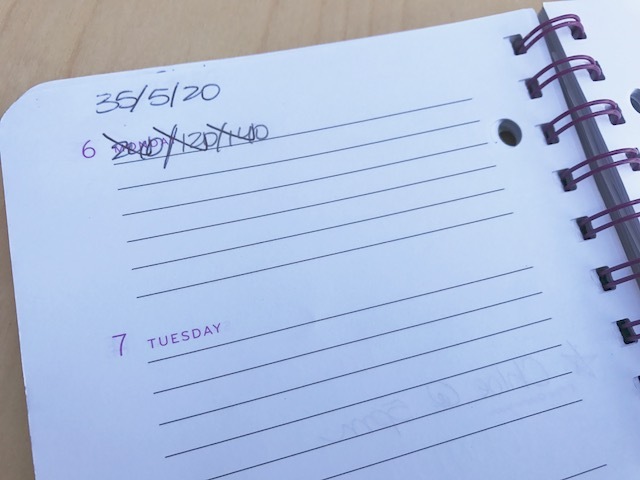 In the above picture, you can see 35/5/20 at the top of the planner. We were saving for a few other things with sinking funds too. The 35 was for a spring break trip to see our family in GA, the 5 was for the kids' school shopping envelope and the 20 was for Christmas. Below that you see other numbers crossed out. Those were the cumulative numbers - the amounts I should have in total in each envelope on that given week. If I was putting the correct amount in each week, then I was on track to being fully funded for each event. So far, so good. Next week I'll be chatting about how I did sticking to our sinking fund. Spoiler, I didn't hit our number. However, that is no reason to give up! It just means we needed to adjust our plan. Happens. Do you think that a Christmas sinking fund and budget might be something that you're interested in? 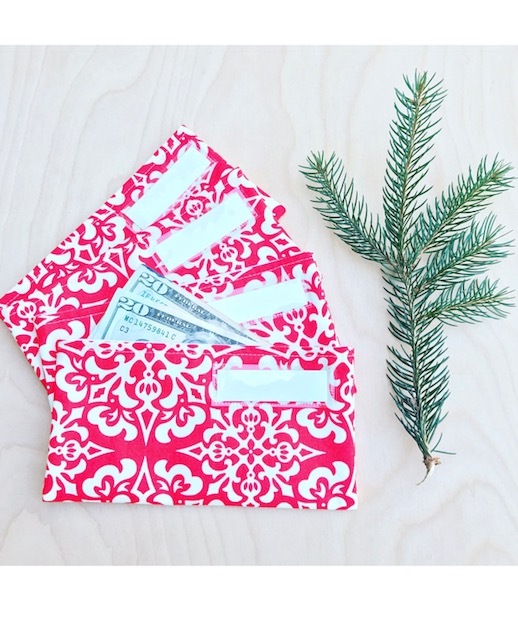 Enter to win your very own Christmas cash envelope over on my Instagram feed: www.instagram.com/daisylanedesign. And come back next week to see how the Christmas purchases are going. Having an actual sinking fund and list has been a game changer. Having cash keeps me accountable. What really has made the biggest impact is cutting my list down to bare bones. I’ve switched gift giving at school out for volunteer days and signing up I serve our teachers during holiday lunches. Great conversation starter. I’ve finished this years shopping and already pondering next years changes. Yes!!! Giving yourself "permission" to opt out of what seems like everyone else is doing is a fantastic step in the right direction. It's so freeing to know that you don't have to do the holidays like everyone else! And feels even better to know that on the other side of it, it's all paid for and not hanging over your head. Great job! Yes! These are great & all what I'm trying to do...I can't wait to have 7 yrs experience with it!! Nona- Soo true..the past 2 years I have swapped expensive credit card gifts for school or church family with very practical home goods- homemade lotion and yummy home made goodies.....this had been the most stress-free Christmas so far... can't wait for next year!!!! !